My previous work involved researching shark diving, shark behaviour and, as one of my favourite things to do is dive with sharks, I feel I’m in a fair position to delve into a conversation about this potentially contentious subject with our guests. There are plenty of articles online about shark diving, and the feeding of whale sharks at Oslob in particular, many of them opinion pieces which may, or may not, utilise the facts and science available on the subject. The following is written for our guests (and any other interested readers), to offer some of the facts, some background scientific information, and to inform you on why here at Atmosphere we have chosen to conduct solely snorkelling excursions to Oslob. Despite the whale shark (Rhincodon typus) being the biggest fish in the sea (reaching a maximum size of ~12m) and researchers working hard to unlock their secrets, we still know very little about these gentle giants. In 2016 they were uplisted to “Endangered” on the IUCN Red List, due to a 50% population decline (Pierce & Norman 2016). 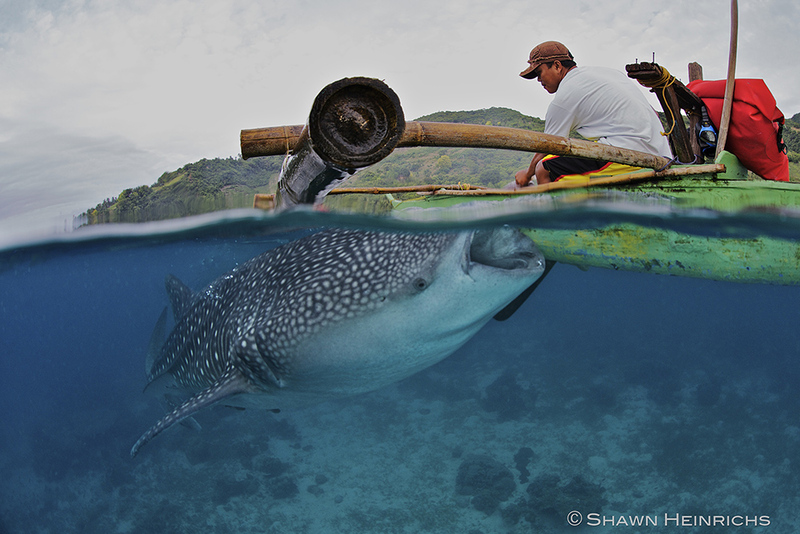 We know whale sharks are migratory animals, meaning they are able to swim incredible distances. The longest tracked individual travelled over 12,500 miles from the coast of Panama, via Galapagos, to just east of the Philippines (Guzman et al 2018). Although it is still unclear why they travel these vast distances, it is presumably connected with feeding and/or breeding. We also know they aggregate at several coastal locations around the world, however, what causes these aggregations to occur is largely a mystery (Copping et al 2018). Whale sharks are filter feeders, feeding predominantly at the surface on tiny zooplankton including krill and fish eggs – removing the primal fear many of us have of being “attacked” by “killer” sharks. Here in the Philippines, the Central Visayas and northern Mindanao were known for their whale shark fisheries, with meat and fins exported as well as being sold in local markets (Fowler et al 2002). Nearby in the Bohol Sea, nearly 700 were landed at two monitoring sites, between 1993 and 1997 (Alava et al 2002). In 1998 a law was passed protecting whale sharks from all consumptive use and exploitation (FAO 193, Department of Agriculture, Quezon City, Philippines, March 25th 1998). Shark diving tourism is a controversial activity that is conducted around the world with a variety of species, in relative safety for the diver and the shark (Richards et al 2015). It often generates the benefit of a higher worth of the shark being alive, than dead (Vianna et al 2012). 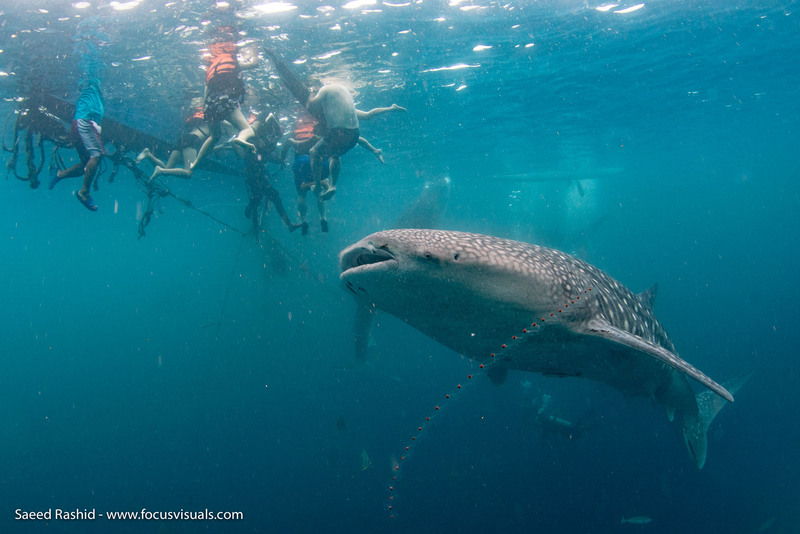 Whale shark tourism in Oslob began in 2011 and, in brief, entails tourists passing through a briefing area, boarding small paddle boats and snorkelling in the vicinity of the boat while handfuls of food are offered to the sharks from the “feeders” who pass by the snorkelers. Oslob now receives over 182,000 visitors a year (Thomson et al 2017) and has created alternative livelihoods for 177 fishers from the small surrounding community (Lowe et al 2018). 208 sharks have been identified over three years (by their unique spot patterns), with an average of 18 individuals seen per week (Thomson et al 2017). Individual sharks ranged in their visits to the feeding site, from a single or occasional visit to seasonal residency and year-round residency (Thomson et al 2017). A recent review of the many relevant scientific articles on feeding whale sharks at Oslob highlights that there is no scientific evidence that provisioning (feeding) harms these gentle giants (Meekan & Lowe 2018). At Atmosphere we offer our guests the chance to snorkel at Oslob, rather than SCUBA dive and we drive, rather than take one of our boats. Reason being; the feeding area is a ‘no motorised boats’ zone but the animals are still surface active in the vicinity, therefore driving means one less potentially dangerous boat propeller in the water. SCUBA divers must stay away from the surface in the feeding area, meaning all they’re likely to see are the bellies and tails of the sharks as they swim past – not an ideal encounter and not ideal for photography. Snorkelers have the best light for taking photographs and are privy to up-close encounters. 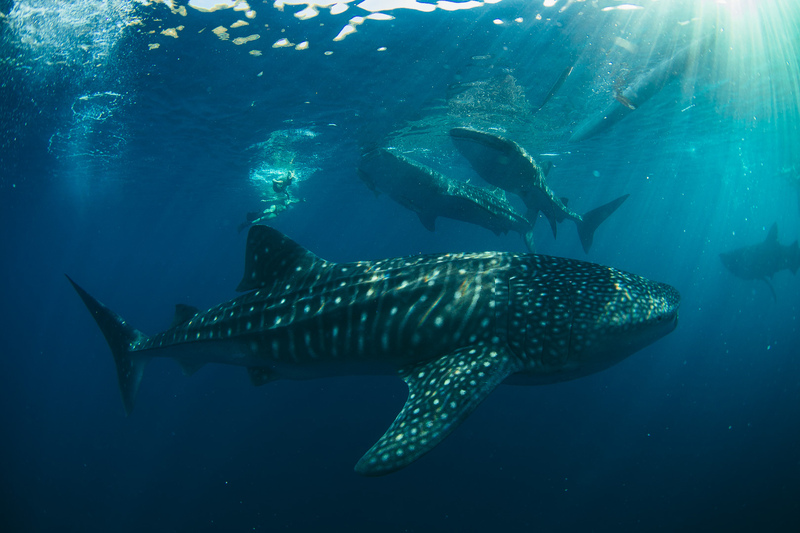 Snorkelling with whale sharks is recommended as the best option through WWF’s Responsible Shark and Ray Tourism Guidelines (Lawrence et al 2016) and is utilised successfully at similar sites around the world. In an ideal world we wouldn’t need to provision sharks in order to regularly encounter them. Having personally experienced a variety of shark diving operators around the world, the community in Oslob seem to be working hard to control and educate the crowds, and limit impacts on the sharks themselves. To our guests, my response to the question above is… if you’re here in the Philippines on vacation, you’ve never seen a whale shark before, and this might be your best chance to get your eyes on these incredible creatures, then go. Just be clear on the context. If you are lucky enough to have already encountered whale sharks then this may not be for you, as nothing will ever beat the rush of being on a dive, looking up and seeing one appear out of the blue. Alava MNR, Dolumbalo ERZ, Yaptinchay AA, Trono RB. 2002. Fishery and trade of whale sharks and manta rays in the Bohol Sea, Philippines. In: Fowler SL, Reed TM, Dipper FA, eds. Elasmobranch biodiversity, conservation and management. Sabah: IUCN, 260. Fowler, S.L., Reed, T.M. and Dipper, F.A. (eds). (2002). Elasmobranch Biodiversity, Conservation and Management: Proceedings of the International Seminar and Workshop, Sabah, Malaysia, July 1997. IUCN SSC Shark Specialist Group. IUCN, Gland, Switzerland and Cambridge, UK. xv + 258 pp.